How could this work in Hitchin, and what next? Councillor Ray Shakespeare-Smith addressed the main questions posed to the Scrutiny Committee, stating how the aspiration for slower speeds has been present for many years and how the Hitchin Committee and North Herts Scrutiny Committees have supported the 20mph speed limits. County and District Councillor Tony Hunter remarked on the high cost of the engineering works required for the piecemeal, street by street introduction of 20mph limits, providing more support for the idea of having zones or several adjoining streets having a joint scheme. This was echoed in Rod King’s comments that councils are thinking about the larger (macro) picture, deciding that zones covering a wide area, preferable a whole town, provide a more efficient way of slowing traffic, and thus providing safer and healthier neighbourhoods. In 2012 the late Councillor David Billing applied to have 19 streets designated as having 20mph speed limits in the Bearton ward. The 85% rule then used indicated that only 12 of the 19 could have this speed limit introduced. Each of those 12 streets would have had to have a separate speed limit applied. If a 20mph zone had been applied for it would not have been approved. 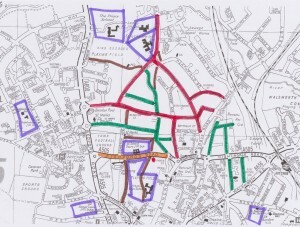 This map shows the roads accepted for 20mph in green, those not accepted in red. 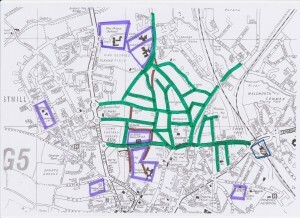 The next map shows what a zone of roads would look like, with the inclusion of Fishponds, Nightingale and Grove Roads, it is a coherent whole, providing a safer environment for a solid residential area, at a fraction of the cost and more effective than single speed limits on individual streets. The County draft Speed Strategy does not seem helpful in thinking about these changes. Rule C8 says that “20mph zones without physical measures will only be considered when the following applies: Where at least 90% of the total number of roads in the proposed zone have existing mean speeds of 25mph or below”. That would exclude the Bearton area. This seems contrary to the spirit and aspirations of the DfT guidelines. The area is solidly residential with footpaths crossing it, and several schools nearby within walking and cycling range. The DfT new circular gives some encouragement for the introduction of 20 mph zones, recognizing the benefits particularly in residential areas, even if the roads are major or ‘A’ roads. 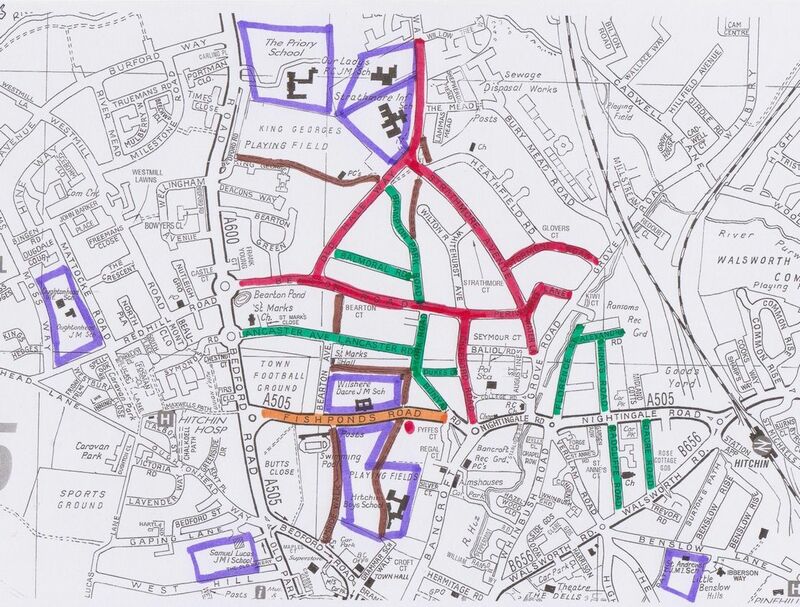 Therefore the roads around the Bearton zone, Fishponds, Nightingale and Grove Roads could be included. The importance of including these roads is emphasised while they are used by the very large metal waste trucks (800 journeys per day to and from Cadwell Lane) and which have been known at times to have been driven without due care and attention to local residents. But the County’s draft Speed Strategy states – Rule C10 – “20mph limits and zones will not be generally considered on the A & B road network”. That seems to deter the prospect of the inclusion of the residential streets which have been designated as ‘A’ roads, even when they have schools sited along them, and with walkers and cyclists using them as main routes to the train station. Other authorities (notably Islington and the City of London) have included all their main roads within their 20 mph zones. What is clear is that people need to know more about the benefits of such schemes and how they have been accepted and embraced elsewhere. One response has been JIMBY – just in my back yard (20mph in my street please, but not on my route to work or where ever). The benefits seen elsewhere have led to a widespread acceptance and desire to extend 20mph zones in towns. The Scrutiny Committee seemed to give a green light to the introduction of the lower limit in residential areas where local people want them. 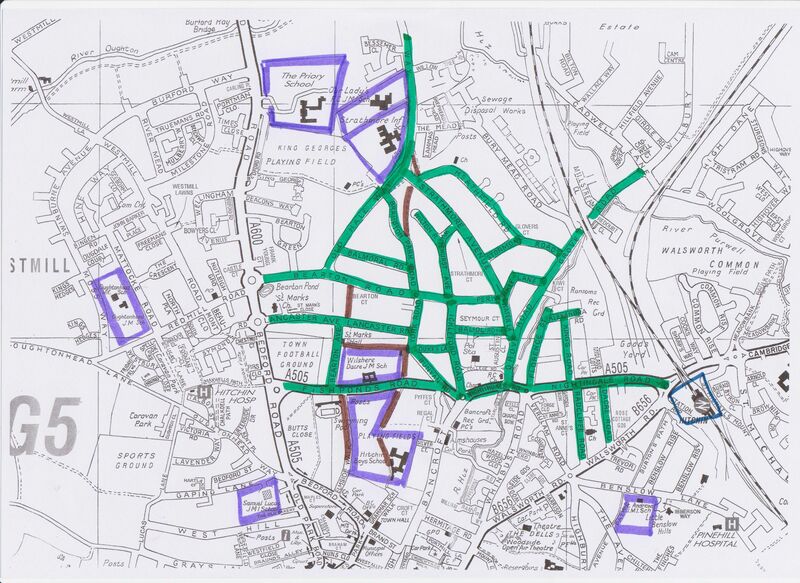 If this is confirmed amongst the powers that be at the County Council it will be necessary to decide whether zones within Hitchin or even a whole town scheme should be introduced. This will require a detailed look at what areas would benefit from a zoned approach, whether one zone for the whole town is appropriate, and whether this would have popular support. We look forward to the county and district councils finding a way forward.